The Northland Corridor Redevelopment Project will initially be anchored by the Workforce Training Center (WTC). The Project is being funded by Empire State Development and NYPA as a major component of Governor Andrew Cuomo's "Buffalo Billion" economic development initiative. A portion of the 683 Northland facility and adjacent vacant parking lots are the properties that will be utilized by the WTC project. Due to funding considerations, the project is envisioned to be advanced in two or three phases. The first phase will include development of the WTC and stabilization/select demolition at 683 Northland, as described below. The establishment of the WTC serves as an anchor for the site, enhancing the desirability and marketability of the remaining portions of 683 Northland, followed by the surrounding properties. Depending on available funding and any identified users, succeeding construction phases will include building and site improvements for the remaining properties. When funding becomes available for building improvements, or when specific users are identified for the buildings, detailed site plans will be developed. 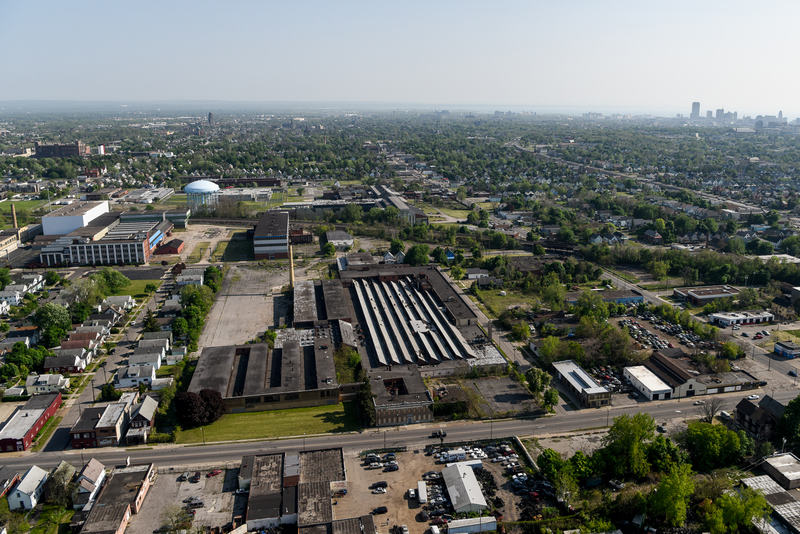 Future development site plans will require approval from the City of Buffalo Planning Board. A brief description of the recommended redevelopment for each property is provided as follows. The Office portion of the building (approximately 40,000 square feet), and approximately 60,000 square feet of the former manufacturing area is slated for reuse as the WTC. The building will be renovated and restored to Department of Interior standards for Historic Preservation. The stabilization work would include asbestos abatement, select demolition/removal of contaminated wood block flooring and unneeded equipment, industrial cleaning, brick repair, and roof, door and window replacement. Building interior features and mechanical systems, including heating, plumbing and lighting systems, are obsolete, non-functional and/or do not meet current code requirements. New lighting, plumbing, electrical and heating/ventilation systems would be installed. The office building would be upgraded and refurnished to support educational use. The existing paved areas located east and west of the existing structure, and existing parking areas on the North side of Northland Avenue, would be repaired and/or resurfaced to support parking needs for the WTC. The remaining portions of 683 Northland (i.e., former manufacturing space that will not be utilized by the WTC) are a good fit for a conversion to a multi-tenant use and/or incubator space. The facility offers open high-bay spaces as well as crane infrastructure and potential for rail service. The transportation access is good with proximity to Route 33, I-190 and the Peace Bridge. After the WTC building plans are finalized, the remaining spaces will be marketed to potential tenants. The building at 631 Northland Avenue is in a state of disrepair, but appears to be structurally sound. The recommended short-term action is stabilization of the structure, with asbestos abatement, select demolition and removal of unneeded equipment, industrial cleaning, and brick repair, and roof, door and window replacement. If the cost to fully prepare this building for re-use exceeds the available project funding, the action could be reduced to minimal building stabilization to prevent further deterioration. The building is a good fit for single tenant user or warehouse conversion. The facility offers a large high-bay space as well as crane infrastructure and potential for rail service. In addition, its proximity to the WTC may enhance the marketability. User-specific site or building improvements may be required to support any new building uses. Site plans, in conformance with City of Buffalo requirements, will be submitted for review and approval prior to any subsequent redevelopment phase. The building at 741 Northland Avenue is in a state of disrepair. The north facade and the north half of the west side of the structure consists of a perimeter concrete foundation wall that supports a partial height concrete masonry unit (CMU) wall. The façade area above this is clad with "transite" paneling (i.e., the trade name for a composite rigid siding known to contain asbestos). A two-story addition that has collapsed is attached to the center of the west-face of the building. The western bay addition is constructed of CMU walls, with wood framing; the northern portion of the wood-framed section has collapsed. The remaining portions of the building are steel framed and appear to be structurally sound. The recommended short-term action for this property is stabilization of the structure, with the select demolition/removal of the collapsed areas. This property is a good fit for a multi-tenant or incubator complex. The facility offers a large high-bay spaces as well as crane infrastructure and potential for rail service. Prior to re-use, additional building improvements would be required including: removal of unneeded equipment, asbestos abatement/removal of the transite siding, replacement of the siding, industrial cleaning, roof repair or replacement, and door and window repair or replacement. New lighting, plumbing, electrical and heating/ventilation systems would be installed. User-specific site or building improvements may be required to support any new building uses. Site plans, in conformance with City of Buffalo requirements, will be submitted for review and approval prior to any subsequent redevelopment phase. The building at 777 Northland Avenue is in an extreme state of disrepair. The building consists primarily of grouted stone foundation walls that support brick walls, which are partially collapsed on the eastern and southern sides of the structure. Large portions of the roof have also collapsed. Due to the dilapidated condition, subject to SHPO approval, the recommended action for this property is demolition and backfilling of subgrade building floor areas to prepare a level, shovel-ready site for future development of commercial or light industrial uses. The property is adjacent to a vacant lot to the east which may be developed as well. If combined with the vacant lot, the property would offer more than 12 acres. The transportation access is good with proximity to Route 33, I-190 and the Peace Bridge. Site plans, in conformance with City of Buffalo requirements, would be submitted for review and approval prior to any subsequent redevelopment phase. The Main Plant area at this facility has been impacted by industrial releases of petroleum and chlorinated solvent products, with significant levels of contamination located beneath the floor. It is likely that the floor will require removal to facilitate site remediation under a NYSDEC program. In addition, the Main Plant area is in an extremely deteriorated structural condition. The Eastern Plant Addition occupies approximately 41,000 square feet and is located along East Delavan Avenue, on the northeastern portion of the property. The building is in a state of disrepair, but is considered to be salvageable. The Heat Transfer and Loading Dock building is located at the southern part of the complex, nearest to Northland Avenue. It was added to the complex in 1952. This building is in relatively stable condition. The recommended short-term action for these portions of the complex is minimal building stabilization to prevent further deterioration. After the buildings are stabilized, new light industrial or commercial tenants will be sought. User-specific site or building improvements may be required to support any new building uses. To prepare these buildings for re-use, the required actions would involve abatement of asbestos and removal of contaminated materials, brick repair, industrial cleaning, roof repair or replacement, and door and window repair or replacement. In addition, new lighting, plumbing, electrical and heating/ventilation systems would be installed. This property is a good fit for community use and/or multi-tenant conversion. The Eastern Plant Addition Area offers some higher-bay spaces and frontage on East Delavan Avenue. The loading dock area offers an enclosed truck dock. The transportation access is good with proximity to Route 33, I-190 and the Peace Bridge. The environmental regulatory status is a concern at the property. BUDC is entering an Order on Consent with NYSDEC to address contamination at the facility and the NYSDEC requirements may affect the future redevelopment of the property. The stabilized spaces should be marketed to potential tenants. Site plans, in conformance with City of Buffalo requirements, must be submitted for review and approval prior to any subsequent redevelopment action. Vacant lots on the North Side of Northland Avenue that are currently parking lots are needed to support the WTC and will be rehabilitated to meet current City of Buffalo parking lot standards. These properties include 644 Northland, southern portion of 664 Northland, southern portion of 688 Northland, and 690 Northland. The northern portions of 664 Northland and 688 northland are within a residential zoning area and those parcels could potentially be subdivided for residential use. Vacant lots on Dutton Street (126 and 128) could potentially be developed for commercial or light industrial use, however, they are relatively small. Those lots could potentially be marketed to the owner of the adjacent commercial properties. The vacant lot at 767 Northland is surrounded by 777 Northland and should be combined with 777 Northland as a shovel ready commercial/light industrial site.